We’ll be closing our Voice & Messaging survey early next week, so if you want a freebie copy of the summary results, you need to get going and complete it now. If you just do the mandatory questions it takes about 15 minutes. We’ve had a few surprises. Either the Prozac’s been on special offer this month, or things are looking up. You’re overall quite positive about revenue growth in mature markets — but opinions are divided. We’ll be doing some “slide and dice” to find out who and why. FIGHT: Rapidly improve service capabilities to include presence and multimedia features, offer a softphone/IM service, expand interoperability efforts with other carriers, lower prices and/or offer large/unlimited tariffs. EVADE: Build service around unique assets like home hubs and fixed-mobile converged products. Avoid high-priced flat-rate Internet access and sell value-based bundles of services with inclusive connectivity charges. CO-OPETITION: Offer a limited partnership, and co-operate only where capabilities and services don’t overlap (e.g. access to pre-paid payments for premium Internet services). In-source selected products like mobile photo sharing to fill service portfolio holes. Revenue share search and advertising. CO-OPERATION: Partner in sales and marketing, leave the advanced messaging, media and search/advertising services to the Internet partner, and focus on legacy voice/messaging services, billing and customer service. RETREAT: Move to a pure pipe model of selling service. Use Internet brands as primary retail channel partners (“Google phone” etc. ), and focus on underlying infrastructure and service delivery. Just under 50% of respondents so far selected “fight” as the best or 2nd best option. Given the overall lack of confidence you’ve expressed in the industry’s future based on current trends, maybe this is a message to CEOs and boards to switch from playing defence to offence? Perhaps the Apple/Cingular iPhone is a first stage of a new features and user experience war brewing in core voice and messaging services? 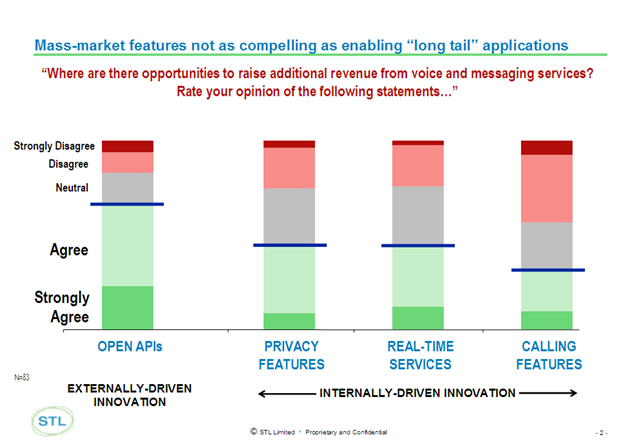 OPEN APIs: By opening up the voice, voicemail and messaging platform with APIs to enable 3rd party services and extensions, operators can generate enough new revenues from partners to significantly offset price competition in core voice and messaging services. CALLING FEATURES: A large number of users are willing to pay for new advanced calling features (e.g. intelligent call routing based on time of day, calendar, recent activity with caller). PRIVACY FEATURES: A large number of users are willing to pay for privacy features, such as multiple or disposable numbers or temporary identities. REAL-TIME SERVICES: At least one new real-time service offered by operators (other than mobile IM) will significantly increase industry revenues by achieving mass-market consumer adoption (e.g. push-to-talk, push-to-view, voice messaging). 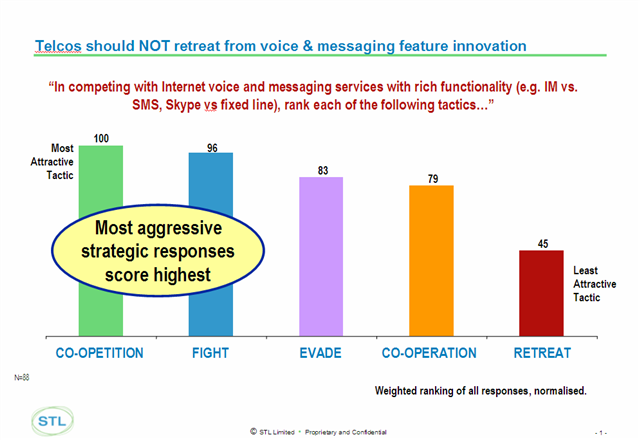 When asked “How well do we as an industry understand what additional needs user have for voice and messaging products, over and above what they have today?” the overwhelming response is “not very well”. This re-inforces the message that operators can compete directly against Internet giants — but to do this they must create a vibrant rival ecosystem as part of a Telco 2.0 open platform play.